Earlier topic: Die Cutting Setup. Coaster stock - reliable suppliers anyone? I used to buy coaster stock from Katz America (heavyweight). I never had a problem with quality and was able to print well reliably. I took a few years off due to a temporary move overseas. I am now back and have opened up my shop. I took an order for coasters and bought the same stock I used to buy (or so I thought). 1000 coasters… every. single. one. was cracked around the entire circumference of the coaster. I call Katz and was told “yeah that happens” as if that was the end of it. After talking to a manager, she apologized but still basically just said “yep, we know, have you tried the medium weight instead?”. She ended up sending out another case that she supposedly personally checked to make sure they weren’t cracked. I now have 209 out of 2000 that I can actually use. that’s almost a 90% defect rate! 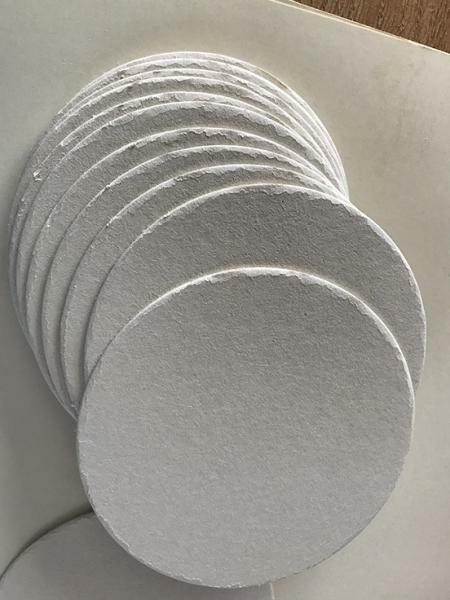 The coaster stock I have left from before is a different color (less white) and, looking at the edges, it is obviously a different product. They have refused to acknowledge that the product changed. Not only am I floored that they don’t care, annoyed that they can’t bother to be honest about their product, and angry that I now have to eat some of my profit because Katz wasted a week of my time, but I also have to find a new supplier that I can rely on getting a quality product from. Ive seen a few threads in the history about coasters, but none of the suppliers seem to still be in business. does anyone have any suggestions on where to get some pre-cut? You might try IPRPaper. I have no experience with their product but it does still seem to be around. Back in the day we had American Coaster Company and their coasters were decent. As I understand it, Katz bought them out. Their coasters have always been quite brittle and crack with any substantial impression, but now it looks like their cutting die is tired and needs a re-knife job. Hopefully they realize this too and it is in the works. I too used to be content with American Coaster Co. but have heard nothing good about their current product. Holyoke Paper has coasters (http://holyokedirect.com/). Pricier than Katz Americas, but maybe it’s a get what you pay for situation. I haven’t had good experiences with Holyoke either, unfortunately. I purchased a manifesto print from him and never got it. I ordered ink from him while overseas and had to call a month later to find out that it was never shipped (got it a couple weeks later, but no apology, no concessions, and it put a huge strain on getting my best friends wedding invites out on time). I ordered something else from him too, paper I think, and same thing, it never shipped. I got a refund for that one, but still cant trust him as a vendor. If Katz decides to fix their dies and put quality back onthe priority list, I will try them out again. In the meantime, I guess I keep looking. I’ve found a couple of places via google search, but I was hoping someone here had a good experience with a reliable vendor and could point me that way. I will test out some places and report back when I have info to share! I will definitely be giving them a call. Thank you so much! Your experiences with Holyoke match my own; recently, I ordered a bunch of paper for a client who had used their stock in the past for other work. When the paper arrived, it was absolutely nothing like the holyoke my client knew and loved; stiff, sized differently, different pulp, different texture. Essentially, it wasn’t the blotter-ish stock of previous orders- it was something else entirely, that frankly felt just like Lettra. When I contacted the owner about it via email, after repeated phonecalls (it was a real “client is panicking” situation), he told me they had “switched paper mills” recently. That was all I was offered- an explanation, nothing else. I never heard back from Katz, but I did receive surprise delivery of another box of coasters yesterday. This time, I cold not find one that had any defect at all. I’d love to know if they sharpened their dies or changed something else. I’m still hesitant to use them in the future but, with enough lead time, maybe. it’s nice to know they can get it right eventually.